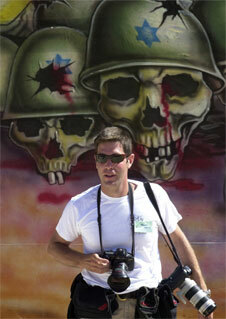 Yannis Kontos has gained a significant place in photojournalism, internationally. He was born in Ioannina, in 1971 and he studied at the Department of Photography, Faculty of Graphic Arts and Art Studies at T.E.I. in Athens. Today, he works as a freelance photojournalist. Collaborator of the American agency Polaris Images, he travels for long periods of time covering the most significant events on the planet. His photos from war zones, his articles and interviews are being published in the most known newspapers and magazines, globally. By now, he has won 15 international awards and he has exhibited many times in Greece and abroad.